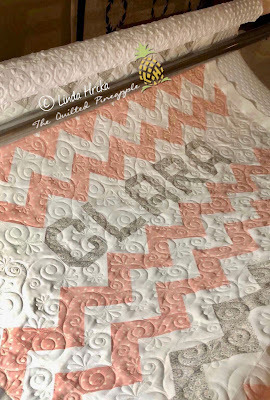 I had the privilege to quilt for one of my first and dearest blogging friends, Thelma of Cupcakes 'n Daises recently. 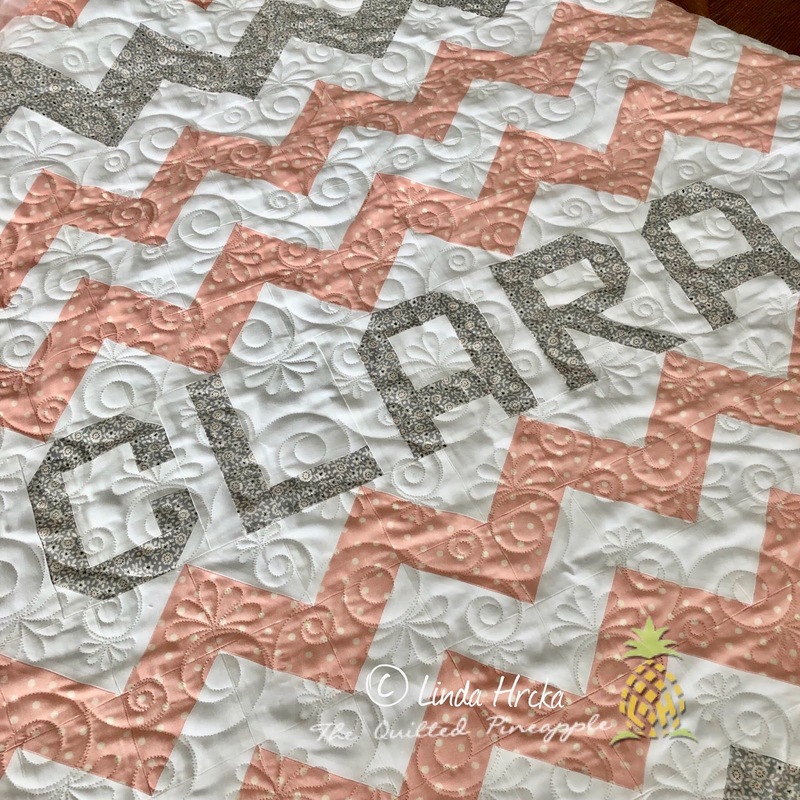 I was so excited when she contacted me for quilting baby quilts for twin girls. Something very near a dear to my heart for obvious reasons. :-) Also, Thelma is an impeccable piecer, so I knew her quilts would be a joy to quilt. I could not have loved these quilts more! So pretty and darling for twin girls. Love the names Clara and Adelynn. 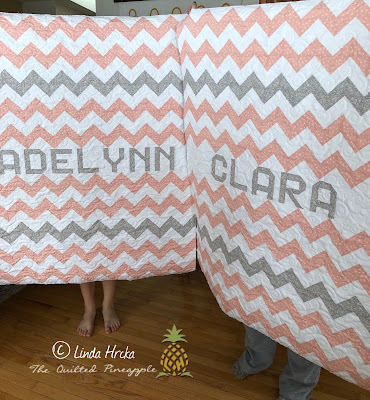 I especially love how Thelma included their names in their quilts!! That is just awesome! 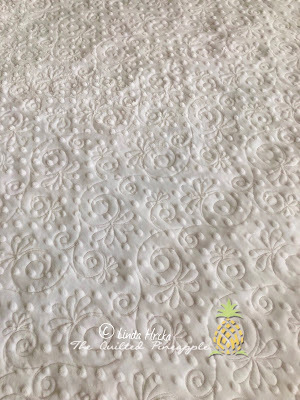 We talked about quilts designs and both thought Chantilly would be perfect. So pretty! Chantilly is the digital quilt design from Leisha Farnsworth of Quilting It. I love her quilt designs! I quilted them on my computerized Innova. White batting from Quilter's Dream and Innovatech thread in white. For those not aware, I offer very affordable computerized edge to edge quilting here, or available in my shop. Love the back! 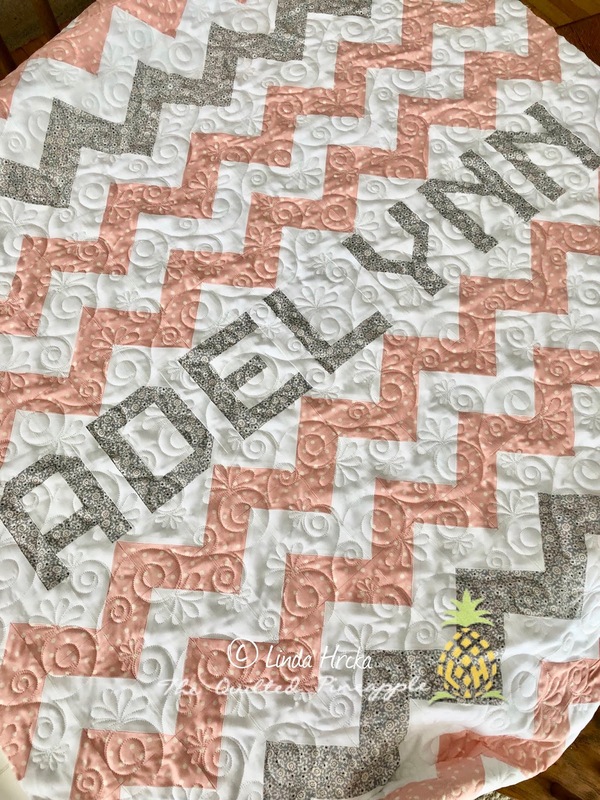 Minky makes for a wonderful backing for baby quilts, soft and snugly. I managed to take a photo right before quilting. Such a pretty quilt! This is my favorite photo! My very special quilt holders. I thought it was only appropriate that my twin girls hold up these twin girl quilts. A and E's feet peeking are the best. lol. I just wanted to thank everyone for the kind comments on my previous post and all the emails. You know how to make someones day! It was nice to reconnect with all of you and hear that you were happy I was blogging again. Me too. Also, if you missed it in my previous post. I extended my holiday sale on my templates, rulers and dvd through Monday available here or clicking the shop button. IN ADDITION, a bonus code BLOG for an additional $10 off. Be sure to check out my post here for more details. Thelma is also posting about these darling quilts today, so be sure to read all her details here. Love that you're blogging again and that we can see what you're working on. 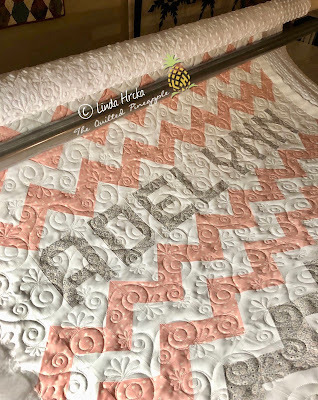 I have a quilt on the frame right now and have been using your rulers that my dear hubby ordered for me last Christmas! You made those quilts which were already adorable just perfect! They are sweet quilts for twins. How fun that your twins could be the quilt holders. 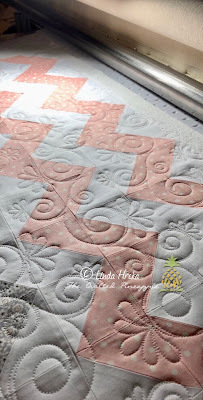 I love that design you quilted--very pretty. 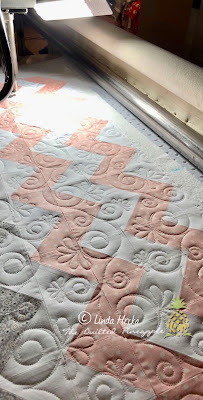 Perfect quilts quilted with a fabulous design. Lucky little girls!! These are darling quilts! 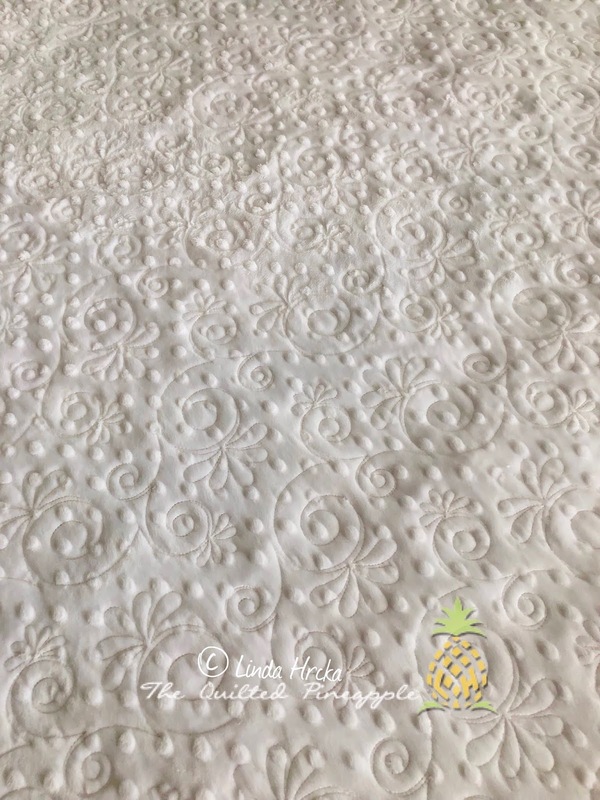 The Chantilly design is perfect too! Wow, those are really great quilts. To take the time and put the name into the heart of a quilt takes a lot of time. I am in love with that quilt design too. So pretty.